I love casual basics and it goes without saying that a great t-shirt (or 6) is a staple in my closet. When worn with the right shoes and accessories, a simple tee can make a pair of jeans look so polished and put together. The ones below are some of my current favorites. How do you wear your favorite tee? great post and amazing shirts. I love the graphic one most. 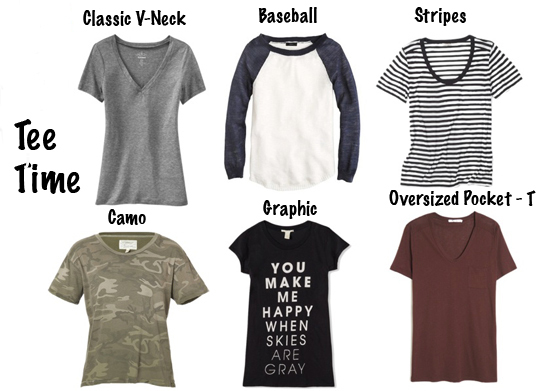 V-neck, Striped and Baseball Tee's are currently in heavy rotation in my wardrobe! i'm a huge, classic t-shirt fan! so easy to dress up and down! The stripes is my favorite. Striped tees are so versatile. I will always be a fan of grey shirts....esp. the American Apparel deep V!! You know you and I are on the same page with this. T-shirts have been piling up in my closet, especially now thats the weather is warming up. I need that baseball sweater asap!